Can a coolant flush help my vehicle from overheating? Antifreeze, like the name is designed to keep your engine from freezing but it also keeps the temperature from becoming to hot and prevents the engine from overheating. It lubricates and moves through the engine keeping it cool as the engine functions. But what tends to happen over time is the antifreeze starts to get old and dirty. Once this happens it will leave sediment in the cambers of the engine and other cooling parts. This sediment then begins to retain heat instead of acting as a coolant and causes your engine to start overheat. 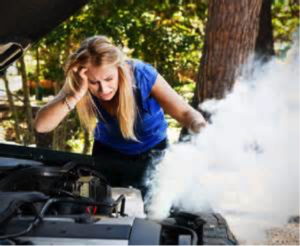 Overheating is the most common cause of vehicle breakdowns and engine damage. This is particularly a problem now days. Unfortunately in order to lighten the weight of today’s vehicle, so they can have better gas mileage, the metal in parts like the engine, heater core, radiator and water pumps have been significantly thinned out. This has in turn made engine parts more susceptible to erosion and corrosion. With all of this in mind it is important to check your vehicles owner’s manual to see the recommended interval for changing your antifreeze and flushing your coolant system. New antifreeze will help your car’s engine run cooler, and flushing it will remove any dirt, rust or sediment which may damage the water pump and clog the engine water jacket and radiator. *Please be cautious in buying your own antifreeze! Like oil, you must make sure it is the correct type for your vehicle. Not all antifreeze is made the same.